I met Peter in 1966 when his friend Paddy Shannon took me to meet him in the company of Richard Warner in a Malone Road outpost of the Ulster Museum. He had graduated in Archaeology the previous year and had just started as an assistant curator. A mutual interest in lithics led to many weekends of field-walking and the plotting of Mesolithic and Neolithic artefact distributions. Back in those days Peter still hadn’t committed fully to the Mesolithic, and one of the first excavations, at Mad Man’s Window on the Antrim coast, involved extensive evidence for Neolithic flint extraction. Finds of Mesolithic artefacts focused attention on specific sites, however. 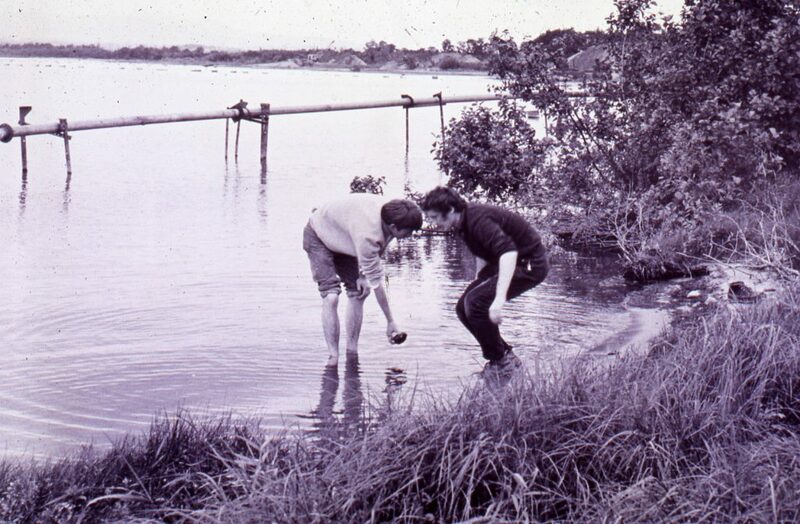 There is a wonderful picture of the two of us paddling in Lough Neagh, picking up Mesolithic ground stone axes that had accumulated courtesy of the sand-shakers at Madden’s sandworks near Toomebridge. Nevertheless, a week’s excavation at Madden’s showed that nothing was in situ, so a search was begun for stratified sites. As luck would have it, this search resulted in the excavations at Newferry and Mountsandel on the Lower Bann, two sites that allowed Peter to flesh out the story of the earlier and later Mesolithic in Ireland. Just how lucky do you have to be to be given those two sites? As an assistant on these excavations I had the fun of playing at archaeology, while Peter had the responsibility of making sense of it all—not to mention using the new evidence to overturn the prejudice that had existed against the Mesolithic into the early 1970s. For the record, when my trowel hit a ground stone axe embedded in the basal sand below the diatomite at Newferry, I knew that we had the earliest axe in Ireland (a calibrated date for a branch beside the axe indicated a date before 7000 BC). I also knew that if I lifted it Peter would never know for sure that it had been in situ. So I let him dig it out, so that he could see the unmistakable imprint in the sediment; henceforth he would be able to state with conviction exactly where it had come from. There was a lot of fun for young archaeologists in those early days, with the whole of Irish archaeology at our feet. Let’s say it wasn’t unheard of for drink to be taken, or cards to be dealt. But there was a job to be done: the Irish archaeological record had to be dated and understood, and Peter was a key player in the wider team tasked with making sense of it all. Those formative years with Peter cured me of stone tools and allowed me to concentrate on ancient oaks. Although it was never stated, we agreed that he could have the ‘stone’ and I could have the ‘wood’. We never imagined that one day, following these pursuits, we would both have professorial chairs. What surprised a number of us back in the 1970s, given that he had one of the plum archaeological jobs in Northern Ireland, was that he should embark on a Ph.D. In our view he didn’t need one, but possibly there was a plan in Peter’s mind. Sooner or later the professorships in Galway and Cork were going to become available, and anyone going for one of these positions would need a doctorate. As it happened, his Ph.D thesis formed the basis for his 1978 volume The Mesolithic in Ireland, a text that stamped his authority on the period. By that time Peter, as befitted a maturing academic museum archaeologist, was also teaching at Queen’s University, going to local and international conferences and putting the Irish Mesolithic on the international map. His move to Cork in 1983 extended the study of the Irish Mesolithic to the south and west of the island and coincided with the start of his important excavations at Ferriter’s Cove, later published as Excavations at Ferriter’s Cove 1983–1995: last foragers, first farmers in the Dingle Peninsula. All of this rounded out Peter’s career. Running a department, being part of the National University, teaching and motivating students while researching his beloved topic and taking the message out nationally and internationally made him a National Institution, recognised not least by his election to the Royal Irish Academy in 1988. But Peter’s interest in the early colonisation of Ireland extended even more widely through issues of indigenous fauna and evidence for, and against, land bridges with Britain in the Late and Post-Glacial. He was interested in the whole European background to the early colonisation of Ireland, as witnessed by his many collaborations. A fascinating account of all of this can be found in his 2015 monograph Ireland’s first settlers: time and the Mesolithic. Nevertheless, through all the decades, in many ways he never changed; Peter’s easy and informal manner put people at ease, whether they were first-year students, senior academics or politicians. In Belfast, he could drop in for lunch as casually in 2016 as in 1976. In late 2016 he was planning future presentation of the Mountsandel site and discussing several lines of future collaboration. To me, Peter was always there, but equally he was always going somewhere. For Toni his wife, for his family, and for his friends and colleagues he has left a hole bigger than any excavation. For present and future Irish prehistorians he has left a message: follow that!